CAMP PENDLETON, Calif. – When Capt. Derek Herrera was called to stand in the place of honor Friday at his retirement ceremony, he pressed buttons on what appeared to be a wristwatch as a fellow Marine came to his aid. #AgentOrange has effected not only Vietnam veterans, but their families as well. You can do something to help, please visit our Legislative Action Center athttp://capwiz.com/vva/home/. Once there, enter your zip code, send the prepared letter to your U.S. Representative, and sign as a co-sponsor to H.R. 5484, the Toxic Exposure Research Act of 2014! Any effort made to bridge the gap between civilians and veterans is OK in my book! We can never forget the sacrifices made on our behalf by so many. 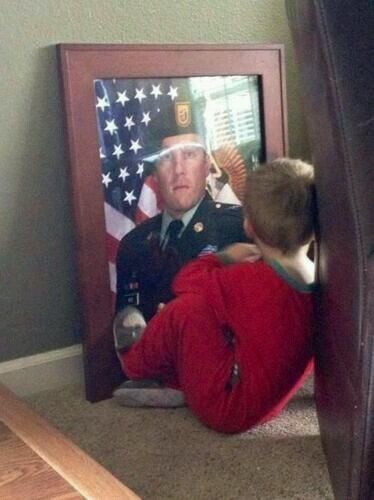 The families of the fallen– life must go on–Without their soldiers.